Do you know what is the better method to maintain and store rotogravure printing cylinder ? 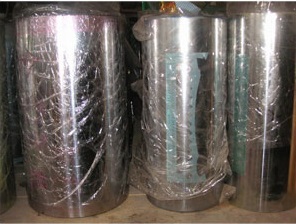 Many customers have question regarding maintenance and storage of rotogravure printing cylinders. coat it with lubricant oil and wrap it well with PET / BOPP film with the Cylinder completely ink free. the vertical and the horizontal cylinders are as shown in the picture. it will fall and the cylinder will be damaged. Placing the cylinders horizontally will save more storage space. Most importantly is cleaning the rotogravure printing cylinder after printing and lubricating.